Hugs for Hailey: Day 2 at Disneyland 2014 - Autographs Galore!! Princess Hailey was ready for day 2 at the Parks. Today will be mostly about meeting characters and obtaining autographs. This will be the highlight for Hailey. Since we aren't having the greatest luck with the new Guest Assistance Pass and there are only about 5 rides total Hailey could go on, this is our mission for today. One place you are sure to find Mickey is in ToonTown, at his house. This day Fantasia Mickey was there. We've never seen him before, we've seen regular Mickey. Again Hailey was determined to stand on her own and I was in the background holding my breath ready for a quick catch if necessary. 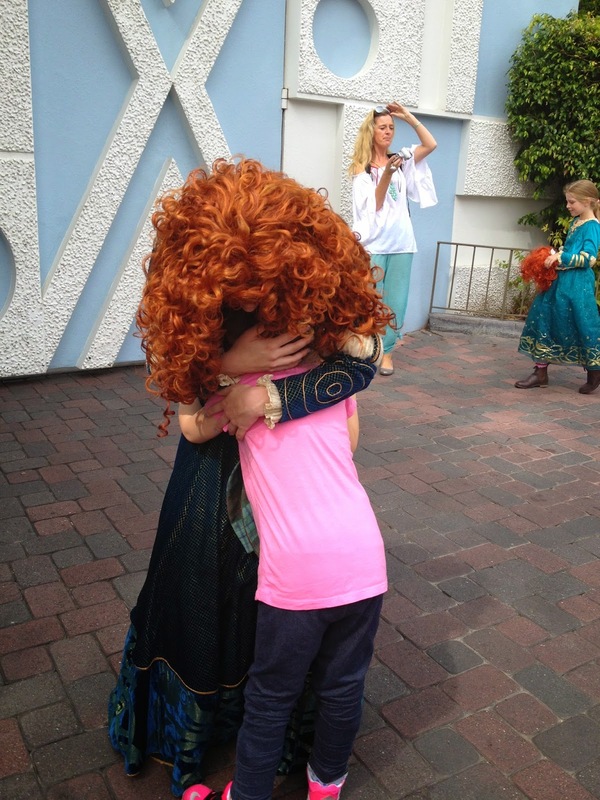 Hailey's ABSOLUTE favorite princess is Merida from Brave. Last year Hailey was NOT able to bare weight on her legs or get out of her wheelchair. Lucky us this was the same Merida as last year and she REMEMBERED Hailey!! That meant SO much to us! She told Hailey that Hailey was a Brave girl and that she was so happy that Hailey came to see her and that Hailey was standing on her own! Merida made Hailey pinky promise that Hailey would keep being Brave and would come back to see her again next year and every year after that. Again I teared up. 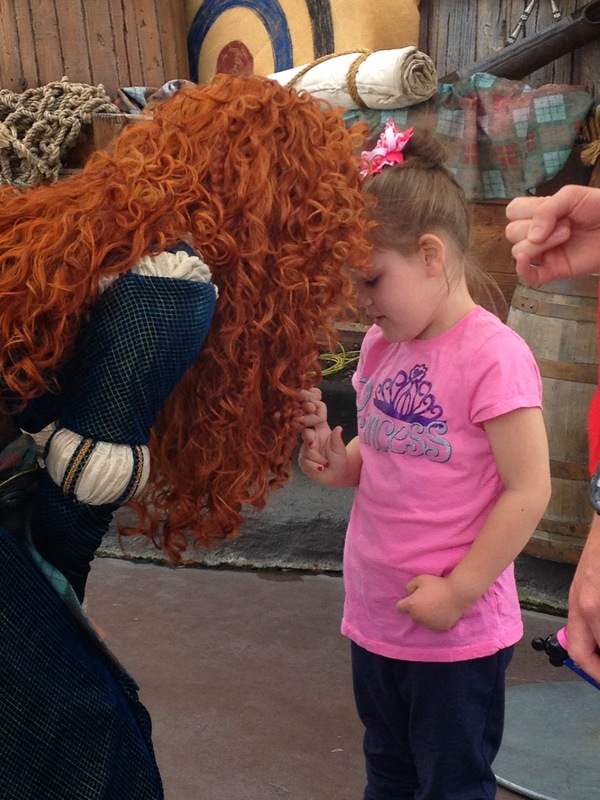 Hailey listened so intently to the words Merida was telling her. Merida might never know how much that meant to me and how I know that Hailey will remember this moment, but I wish she did. Hailey was the last child before Merida "had to go feed Angus her horse." Merida asked if Hailey could go for a stroll and I could only nod my head because if I spoke I'd cry. Hailey got to walk with her favorite princess! Last year at the hospital before we went to Disneyland and Hailey was wheelchair bound we were told she'd most likely never walk again. Her disease was progressing too fast. One year of not being able to walk and tons of physical therapy and leg braces and determination and our little girl is taking steps at Disneyland with a princess. 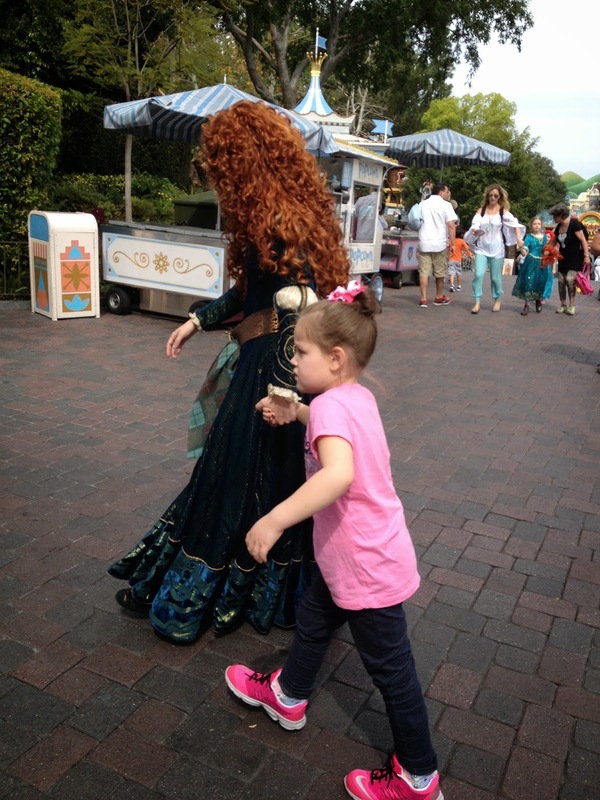 Merida had so much patience as she walked with Hailey and I knew that this would be once of the best experiences for Hailey to have. We took a video as well and posted it on our Facebook page. One last very long hug. Hailey did not want to let go. This was the most amazing moment of our trip. I think of all the issues we had during our trip and when I see this photo or see the video I forget all about that and think back to this moment when my daughter was elated with happiness!! Thank you Merida! Hailey knew right away who the next charter we found was. From her chair she pointed and yelled, "HOOK!!" She talked about her friends Katie and Bry who love pirates and made sure I let them know we found Hook! This was the first time ever seeing Hook for any of us. We now know that we can NOT go to Disneyland without an autograph book. When that book isn't being signed Hailey is flipping through the pages over and over. She LOVES it! With Pixie Hollow kinda being tucked away the lines aren't too terrible and Wheelchairs ARE allowed. Last year we saw Periwinkle and Vidia, today we found Tinkerbell. We've never met her before either. What a day of firsts!! We had found Mickey and now we were on the look out for Minnie. Hailey could have just spent all day in Minnie's house in ToonTown. Everything was her size and she was having a ball looking at every single detail. Hailey loves Minnie's autograph by the way! The only place you can catch 5 princesses in one place and guarantee you get time and an autograph is over at Ariel's Grotto for a Character Dining experience. I made reservations to have lunch with the princesses and Hailey was beyond excited for this. If you remember last year this did NOT work out very well. This year and this experience was awesome! Hailey again looking at the autographs. With the issues we had about not being able to take wheelchairs through character lines I talked with Josh about doing this lunch. Yes it's expensive and No Hailey doesn't eat any of the food, and they don't give tube fed children a discount, me paying $100+ is almost worth not fighting the lines. Phineas, Ferb, and the Campfire Girls! These guys were dancing in the street so I stood by while Hailey joined the party. Before our day had even started I had remembered that I forgot sunscreen. I had to stop at the gift shop to spend a small fortune on some Coppertone. While there Hailey spotted a little boy wearing a Make a Wish t-shirt and she said to him, "I HAVE that shirt too!!!" There was a family that was there on their Make a Wish trip and we told them that they are going to have SO much fun and that it was Hailey's 1 year anniversary. This family was staying at the same hotel as us and we were happy to wish them the best day ever! Little did I know I'd run into this family again. 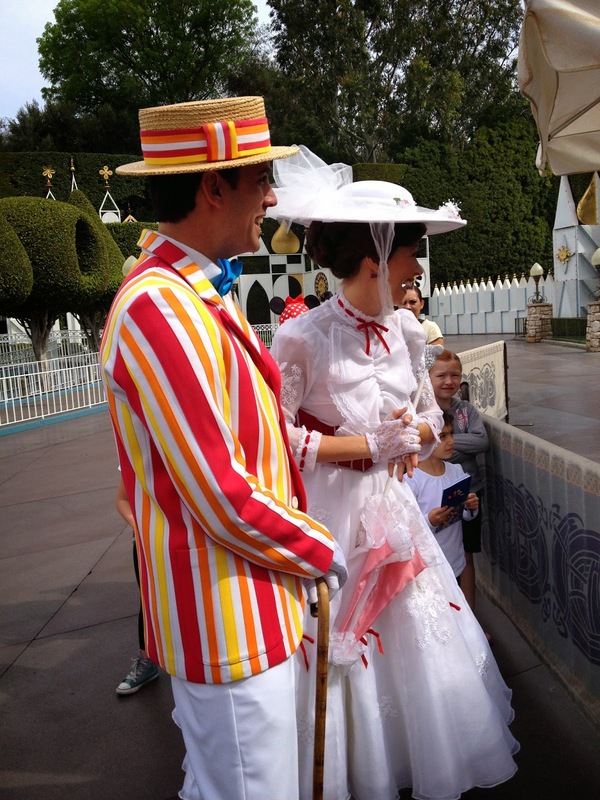 You would think that Disneyland is SO big you'd have a hard time seeing the same people twice, but it was meant to be. While in line for the Disney Jr. Live show (which we've seen 3+ times) we ran into the same family again! I started talking with the little boys grandmother, Missy, and we just instantly clicked. We got on the topics of g-tubes somehow and as soon as I mention "tubie" Hailey wants to show off her new belly pad she had on. Missy hadn't heard of tubie/belly pads so I told her that I have extras and since we are in the same hotel I will send one over to her. She can sew, and it wouldn't be hard for her to make her own. Her grandson, Bubba who is battling Neuroblastoma for the 3rd time, has trouble with granulation tissue and I told her Hailey had the same issues. I didn't know about these pads until my friend Mary sent Hailey some and they have been the best thing ever. The next day when we left the park early I got a message from Missy saying that she and Bubba loved the belly pads and she was going to go home and get started on making them herself. She had needed some syringes and I had extra so we met up at he hotel and sat down to talk. It felt as if I was talking to a friend I've had for years. We are staying connected on Facebook and I am so happy we met! Hailey right away wanted to share the Mickey lollipops she got and she even let Bubba pick the red one! That's true friendship! I didn't used to be able to just start talking to people I didn't know. I was so shy growing up. If it wasn't for Hailey and our situation I don't think I would be able to just start talking to people. When I learn something I want to share it. I know there are other people like me who are doing this whole parenting medically fragile or a child with special needs for the first time, and don't know what to do sometimes. The things that people have shared with me I'm very grateful for and I feel good passing along the information. We are all in this together. Day 3 is just around the corner and maybe 3 days at the park is a day too much. We'll be sleeping in tomorrow and taking our time. Stay tuned to find out how we spent our day!